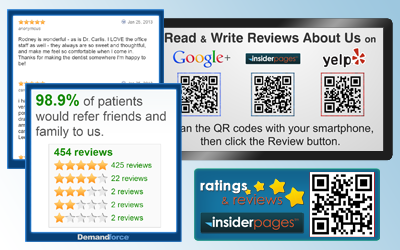 If you're on any review site, you want existing patients to write positive reviews, and potential patients to read them. With DSID, you can now encourage viewers to both read and write reviews, show them where they can do so, and also provide an easy route for them to get there. Like the Social Media app, the Review app makes use of QR codes that can be scanned with a smartphone and link directly to the prescribed site. No matter what review sites you use, whether one or several, we can promote them all and help you build an excellent rating. If you use Demand Force, actual reviews can now be displayed on your DSID digital signage in-office, as well as your referral rating, number of reviews, and star ratings. To start making use of these valuable, practice-building features, contact DSID today.